Born in India Kartik is an Indo-Canadian artist. He grew up in Baroda, Gujarat and Mumbai and it is there that he began his love with sketching observing his architect uncle making building plans and designs. In school his genuine nature asserted itself and Kartik started sketching portraits for which once he got awarded to make a portrait of great Mahatma Gandhi. Kartik became a management graduate instead of an artist. He graduated in 1992 and in few years progressed in his career path to Dubai. In his professional role of Business Development Kartik travelled to several countries of Africa, Middle East and Far East where he got exposed to the rich history, distinctive art and cultural heritage. He was inspired by uniqueness of nature, wildlife, architectural designs and artifacts. The trees of Serengeti ecosystem in Kenya & Tananzia, the cultural blend and architectural designs of Hagia Sophia and Blue Mosque in Istanbul, the Persian gardens and pavilions of Tehran, not to forget the Giza pyramids, Luxor temples and Petra. Also, the Balinese temples influenced by Hindu elements and Pagoda towers seen in Thailand, China and Japan attracted him the most. Kartik received his Master’s in Marketing from UK in 2009 and have made Mississauga, Ontario his home since then. 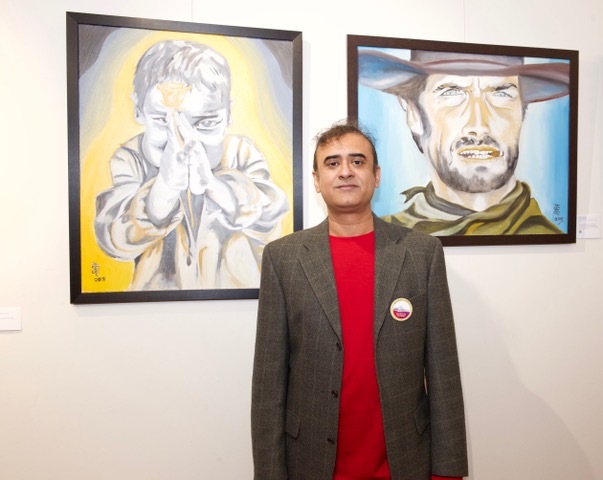 Though he makes a living through sales job Kartik continues to live his passion for art using variety of mediums like acrylics, oil, charcoal and clay on paper & canvas. Kartik’s art show originality of his thoughts and notions about life. His motivation towards painting comes from his fascination to nature and the remarkable colours it generates. Paintings by Vincent Van Gogh and MF Hussain are his all-time favorites. He adores hearing and playing the retro and latest Bollywood music. His forte is portraits, horses, semi-abstract and still life. Kartik’s art is displayed in several private and corporate collections.